The No. 2 seed University of Minnesota volleyball team advanced to the Regional Semifinal after topping South Carolina in three sets, 25-12, 25-15, 25-15, tonight at Maturi Pavilion. With the win, the Gophers improve to 27-3 overall and are one of 16 teams remaining in the NCAA Championship. Stephanie Samedy led the offense with 12 kills (hit .345) and added seven digs. Regan Pittman hit .600 with nine kills, six digs and a team-high four blocks. Adanna Rollins posted eight kills and 11 digs, while Taylor Morgan chipped in six kills. Samantha Seliger-Swenson put up 31 assists, and contributed four kills and three aces. In the back row, CC McGraw recorded 11 digs and was followed by Lauren Barnes who had eight. As a team, the Gophers outhit South Carolina .384 to .147 and held a 46-29 kill advantage. They finished with 52 digs and six blocks while the Gamecocks had 37 digs and two blocks. With the win, Minnesota will host the Regional Semifinal and Final. The Gophers will take on No. 15 seed Oregon, while No. 7 seed Nebraska takes on No. 10 seed Kentucky. Both matches will take place on Dec. 7, times will be announced at a later date. Winners of the Regional Semifinal will play in the Regional Final, and a trip to the Final Four, on Dec. 8. Set 1: Minnesota hit .542 to open the match as the Gophers won the first, 25-12. Pittman added a kill for a 7-4 lead, but the Gamecocks pulled within one at 10-9 on a block. The Gophers, however, went on a 5-0 run and a 15-9 lead at the media timeout. The Gophers went up 17-9 on an overpass kill from Morgan and a Barnes ace as SC called a timeout. The Gophers got six points on Barnes’ service rotation and a 17-9 lead. Minnesota went up 19-10 off a Samedy/Pittman block, which caused SC to use its second timeout. Seliger-Swenson won the joust for a 22-11 lead, and the Gophers closed out the set with an ace from Rollins for a 1-0 lead. Set 2: With a one-point Minnesota lead at 6-5, the Gophers went on a 10-1 run to solidify a 25-15 second set win. The Gophers went up 11-6 off back-to-back kills from Samedy that forced South Carolina to call a timeout. SC called another timeout as Minnesota led, 14-6. The Gophers went up, 17-10 and 21-14, both on Samedy kills. A block by Pittman and Hart gave the Gophers set point, while Minnesota went up, 2-0, on a Hart kill. Set 3: The Gophers hit .472 en route to a 25-15 set win. Minnesota went on a 6-0 run to take a 9-4 lead off a Samedy ace. Minnesota pushed the lead to 12-6 on a Pittman kill and 13-6 on a Morgan kill, which caused South Carolina to call a timeout. Minnesota pushed the lead to 17-9 on a Seliger-Swenson kill, as the Gamecocks used their second timeout of the set. The Gophers closed out the set with a kill by Samedy at 23-14, a Hart kill for match point, while Seliger-Swenson added a service ace for the win. MINNEAPOLIS, MINN. – A season to remember for South Carolina volleyball came to a close Saturday night, as the Gamecocks lost in straight sets to No. 2 Minnesota. The team ends the year with a 20-10 overall record, the Gophers improve to 27-3 and move on to their ninth Sweet 16 in the last ten years. SET 1: A big run for Minnesota broke the opening game open, and the Gophers took the match lead with a 25-12 win. 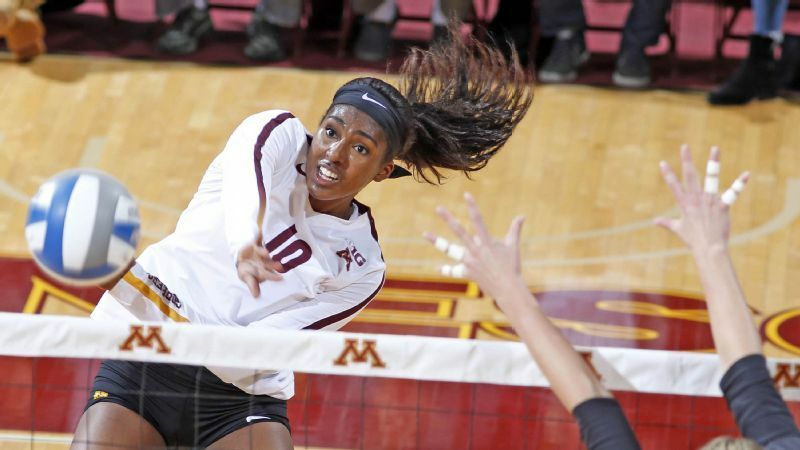 The Gamecocks trailed 10-6 but got within 10-9 before Minnesota ran off nine of the next ten points to comfortably take the set win. The Gamecocks were out-hit .542 to .040, with the Gophers committing just one unforced attack error on 24 swings. The Carolina offense was led by Courtney Furlong‘s three kills. SET 2: Set two would be a similar theme, the Gamecocks got within one, 7-6, but another big Minnesota run broke it open again. The Gophers reeled off nine unanswered points from there to extend the lead out to ten, and won the set 25-15. The Carolina offense was able to match the Gophers kill-for-kill, but were not able to get the runs needed to account for the early deficit. Both back lines of the defense would put up big numbers in the game, with 21 digs for the Gamecocks and 24 for Minnesota. Aubrey Ezell led the defense with seven of those 21 digs. SET 3: South Carolina would enjoy its best offensive performance in the third set, but couldn’t limit Minnesota’s attack in a 25-15 decision that clinched the match. The Gamecocks started 4-for-4 on its swings to open the set, but Minnesota was also lights out early and had six kills on seven swings to power a 6-0 run that put it ahead 9-4. The Gophers totaled 19 kills in the third, and committed just two errors on their 36 total swings. Mikayla Shields led the offense with four kills, and the team would hit .281, but Minnesota finished at .472. With the Gophers ranked No. 2 in the country, Saturday night featured the highest-ranked opponent the Gamecocks have faced since 2010, when they matched up with No. 1 Florida on Nov. 26. Mikayla Shields led the team with eight kills, she finishes her junior season with 1,132 for her career to date. That is the second-highest total through three seasons by any Gamecock in the program’s 46 seasons. Shields also finished with 425.5 points scored for the year, good for eighth-most in the program’s rally-scoring era. Aubrey Ezell’s 12 digs led the team, she finishes her career at South Carolina with 1,460 digs, just four shy of matching the program’s all-time record. Courtney Koehler‘s 1,121 total assists this season are the fifth most in the rally-scoring era. The service game would be a key factor in the match, Minnesota finished with six aces and just four errors while the Gamecocks had one ace and seven errors. STAT OF THE MATCH: Minnesota’s offense entered the tournament ranked fifth in the nation in both kills per set and hitting percentage, and lived up to the hype Saturday night. The Gophers hit .384 for the match as a team, the second-highest allowed by South Carolina this season. UP NEXT: With the season complete, the Gamecocks say goodbye to their five seniors – Callie Brown, Aubrey Ezell, Courtney Furlong, Emma Lock and Jesse Turner. Heading into the spring training season, the team returns all six starters from tonight’s match but will lose Ezell and Furlong from the team’s main rotation.